PROVIDENCE, Rhode Island — It doesn’t always work, but 36 seconds with an empty net and an extra skater proved enough for the No. 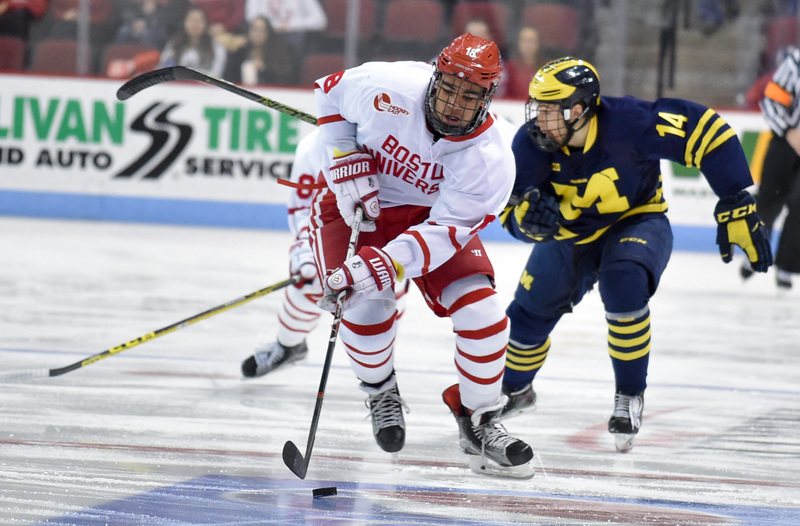 11 Boston University men’s hockey team to get what it could out of Friday night. Down 1-0 to No. 1 Providence College going into the third period, the Terriers (5-3-1, 3-2-1 Hockey East) fended off final frame Friar power-play chances and kept things close. They allowed themselves a chance to score when it mattered, which was tough considering goaltender Nick Ellis denied all but one of BU’s 40 shots on net. But BU did score. With 18:31 gone in the third period, the Terriers found the back of the net and eventually skated to a 1-1 tie with the Friars (6-0-2, 0-0-1 Hockey East) by the time the overtime buzzer sounded. 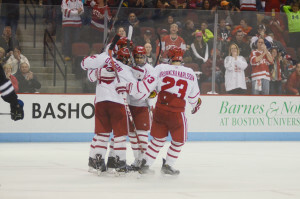 “Just an unbelievable hockey game,” said BU coach David Quinn. “That’s as hard fought a game as you’ll see in any month, let alone November. There was a lot to like about the Terriers’ draw with PC on Friday, so here’s what we thought went right and wrong in this edition of Pluses and Minuses. BU’s penalty kill was put to the test in the third period of the game. 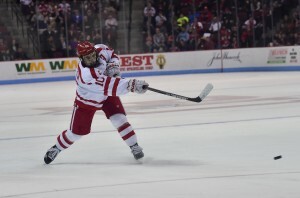 The Terriers managed to emerge from a two-minute 5-on-3 shorthanded situation pristine and garnered the same clean result from a five-minute major. They even generated a couple of chances at the other end of the ice while down men as well. For more on how the penalty kill shaped the game and how it gave BU back some momentum, read Sarah’s sider. Playing in his sixth consecutive game and starting in his fourth straight, sophomore goaltender Connor LaCouvee put together another impressive night in net. He stopped 32 of 33 shots that came his way and continued to feed off his performances in games past. The lone blemish on the netminder’s evening was a power-play goal in the second period of play. Senior Mark Jankowski had the puck at the right point and passed down low to senior Nick Saracino. Jankowski skated closer to the right faceoff dot and Saracino handed it right back before the forward wristed one into the top right corner of the cage over LaCouvee’s shoulder. Other than that, he was perfect. The second-year goaltender has now recorded back-to-back starts in which he’s allowed one goal and has effectively bumped his save percentage up to .920. In his last four starts, he’s posted a .931 save percentage. It was a struggle to get the puck to cross the goal line in the early goings of the season, but it seems senior winger Ahti Oksanen has regained his scoring touch. The forward recorded the game-tying goal with just 1:29 left to play in regulation. His linemate, freshman center Jakob Forsbacka Karlsson, was strong on the faceoff and allowed Oksanen to pick up the puck in the circle. He held onto it and fired at the left corner of the net, where it pinged off the post and rung around the metal frame before settling in the back of the twine. “I had a clear lane to shoot the puck, and when it hit the post, I was sure it was coming back out, but thank god it went in,” Oksanen added. With goals in each of his last four games, Oksanen is second on the team in points with nine on five tallies and four assists. His confidence, he said, is good right now. 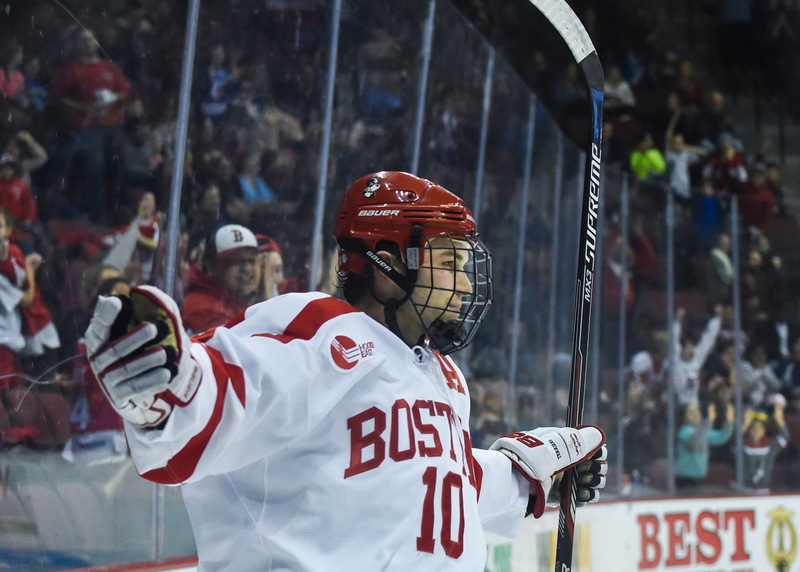 The one big thing BU had trouble with on Friday was its penalties. The Terriers took seven total and gave the Friars 9:15 of time with at least one extra man on the ice, allowing them to convert once as well. Things were tense between both teams as neither gave the other much breathing room and both sides stayed physical throughout. 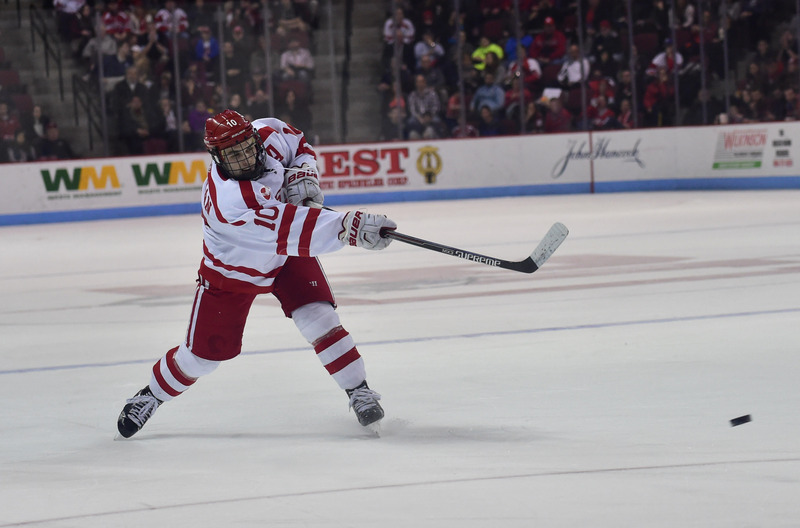 BU picked up five minor penalties as well as one major and one 10-minute game misconduct. Four of those belonged to freshman defenseman Charlie McAvoy. The rookie was responsible for an elbowing minor in the second, a boarding minor in the third and then the five-minute major as well as the game misconduct in the third, too. 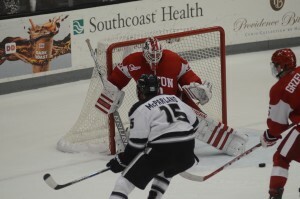 The Terriers kept Providence off the board for all but one of their five power plays, however.